If you didn't think it existed, it does! There are easy-to-follow trails for those who do not have an innate sense of direction. One is the SAW PALMETTO LOOP at the PINELANDS RESERVE COMPLEX. 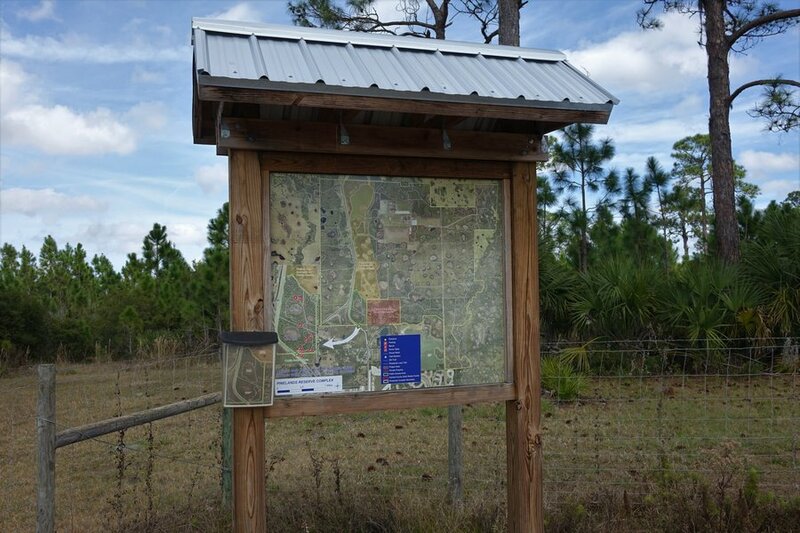 If you've ever gone to the Knight's Trail Landfill off of Laurel Road in Nokomis, then you would have passed this park. 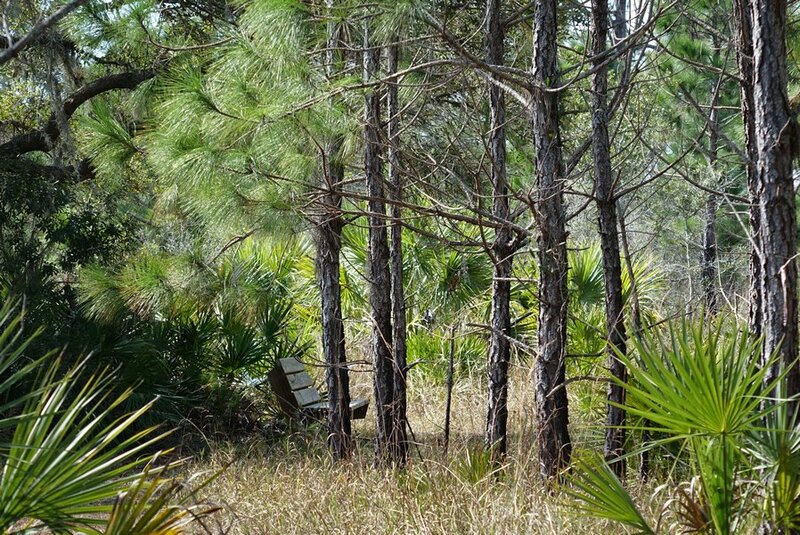 There are two trails to explore: the Saw Palmetto (the shorter one) and the Slash Pine Loop Trail. Because I didn't know if I'd get lost in the "hinterlands," I chose the shorter circular route, figuring that even I could navigate this trail, BUT just in case I was wrong, I hedged my bet by putting 7 trail markers in my pocket! The trail was well-maintained and well-marked. Blue stakes marked my passage as I took my leisurely stroll through the pines and saw palmettos. Along the way there was even a "slalom training ground" for bunnies seeking to hone their evasive techniques. For those wishing to sit and commune with nature and to perhaps quietly await an animal's passage, three park benches served the purpose quite well. For the "directionally-impaired," they also became a trail marker to ensure the trail was being followed. At one point I came to a split and debated as to whether my trail markers were necessary. "If I kept turning right, why would I need them?" I thought. Then I remembered the Myakka State Forest and my inability to remember where I had turned or in what direction I had turned, so out came my markers. Down the trail I continued. This must have been a tasty part of the trail. Rather than using the picnic tables provided by the park, the hogs chose to root out their dinner on the trail before heading on to greener pastures. I think residents and visitors to Sarasota County are quite lucky to have so many opportunities to get away from it all, to get out and experience how the ranch lands must have looked to those who farmed and settled the state, to experience the quiet solitude of nature, to let the imagination wonder as to what the early explorers would have encountered who sought passage through these lands. It's all here. All you have to do is stop.